As a SharePoint Online Administrator, you may need to edit a user profile to identify the relationship between one user and another, to encourage or enhance social collaboration. Or you may need to edit a user’s profile on behalf of someone having trouble updating his or her profile from My Sites. Click Manage User Profiles from the Administration Center window that displays. 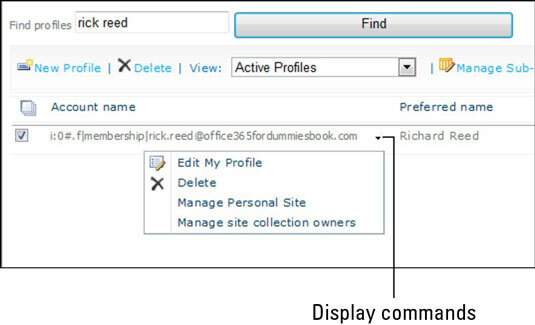 In the People group, click Manage User Profiles. Enter a name in the Find profiles search box and click Find. On the name you want to edit, hover over to the right of the entry and click the down arrow to display additional commands. Enter your edits in the page that displays and then click Save and Close to go back to the SharePoint Online Administration Center dashboard.